Comments: This photograph shows Butler's Harness, Coffin, and Casket Store at 440 Valley Street in Scottsville. The building was also known as Butler's Funeral Home because of its coffin/casket services. John Wesley Butler ran this business and made caskets, harnesses, and other leather goods at his store. The store sign, posted on the tree in front of the Butlers' store, advertised the store as at its 'new location.' John Butler also drove a horse-drawn hearse for funerals. The apartment above the store was the home of John and his wife, Ella Carson (Phillips) Butler, and family (Claude Phillips Butler, b. 1897; Lindsay Wesley Butler, b. 1899; and Agnes Angeline Butler, b. 1903). Standing at the store's front door are the Butlers' sons, Claude (left) and Lindsay (right). At the time of the Butlers' marriage in May 1890, John Butler was the Town Sergeant of Scottsville. John and Ella Butler also ran a hotel in Scottsville for approximately ten years before they moved to their farm named 'Woodland' on Rt. 6 near Esmont. 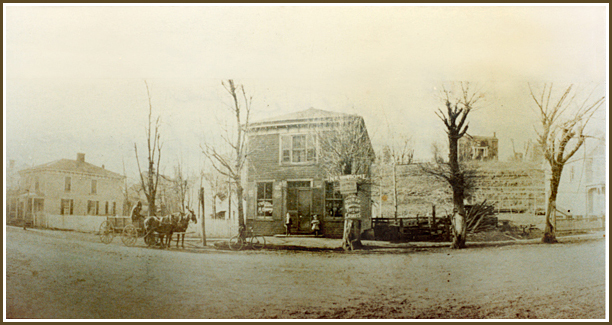 The Butler Store photo above is part of the Brenda Butler Collection. Brenda resides in Leesburg, Virginia, and is the great, great grand niece of John Wesley and Ella Butler.